Since 2014, Jeremiah Ariaz has been photographing various southwest Louisiana clubs' weekend trail rides- the Crescent City Cowboys, Desperados, Buffalo Soldiers, and The Stepping In Style Riding Club, among other groups. 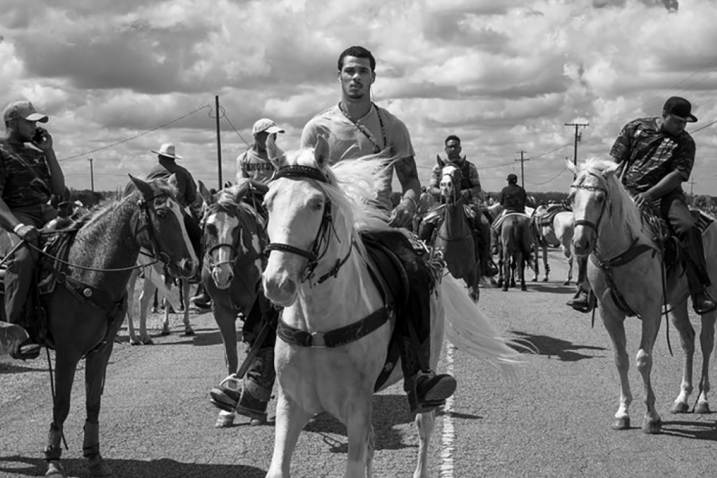 "Louisiana Trail Riders" features selections from this body of work about the distinctive, little-known subculture that upends not only historic and pop-culture representations of cowboys as "gruff, serious, white, and situated in the West," but also the media's "prevailing contemporary images of difference and despair in black America." The African American trail riding clubs have their roots in the Creole culture formed "in the unique region of prairie grasslands divided by water in southwest Louisiana," Ariaz writes, when "a population of Frenchmen, Native Americans, and free people of color took root... Horsemanship became a common way of life. According to folklorist Connie Castille, 'for many of Louisiana's black men, the horse is still associated with freedom, independence, work and respect.'" Ariaz says that the images "assert joy, pride, and family bonds, particularly between fathers and their sons, who are taught to care for and ride horses from an early age... I'm drawn to the multi-generational gatherings, the mix of rural and urban sensibilities, and the zydeco music that provides an-ongoing soundtrack to the weekends."